Tongan society consists of women doing home tasks and men labouring. With this, women make the clothes. But with westernisation being introduced into Tonga, sewing machines and other machines have been utilised to fasten the work. Along with this, television, solar power and just mere electricity is being used more often in the remote an more cultured parts of Tonga. 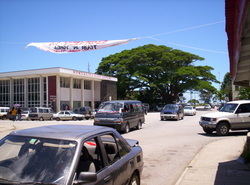 In Nuku'alofa, it is very westernised with shop fronts and cars whilst other islands remain rustic and organic. 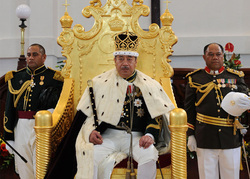 "In November 2009, a constitutional review panel recommended a ceremonial monarchy stripped of most of its real political power and a fully-elected parliament in place of the current, largely hereditary body." (BBC News) Many Tongans have been wanting a change in the government of Tonga. The monarchial society is only through family line, so the Tongan people don't get a say. Tongan's are now wanting to change this so they are like other Western countries such as Australia. Traditional Tongan clothes consists of men and women wearing a tupenu or sarong. This is usually made of leaves or hay like material. With the induction of Westernisation, most people usually don't wear this anymore in Nuku'alofa. If they do, it is generally worn with a 'western' shirt or pants underneath. Most fathers are very strict in what their children wear and, with the diversity of islands, each island and family has different values and beliefs of these traditions.